Sometimes it feels good to take a break from foods and ingredients we eat all the time. I can’t remember the time that I did not consume a salad without oil in it. The Western diet, even when making our own meals at home, contains plenty of fats. But the long-lived populations of Okinawa don’t consume high amounts of fat. Even my grandparents, who ate a Mediterranean diet most of their life (if there is such a thing as the Mediterranean diet; it can be so diverse from one region to another), did not put a ton of oil in their dishes. They considered olive oil OK, but still, were not gulping it. 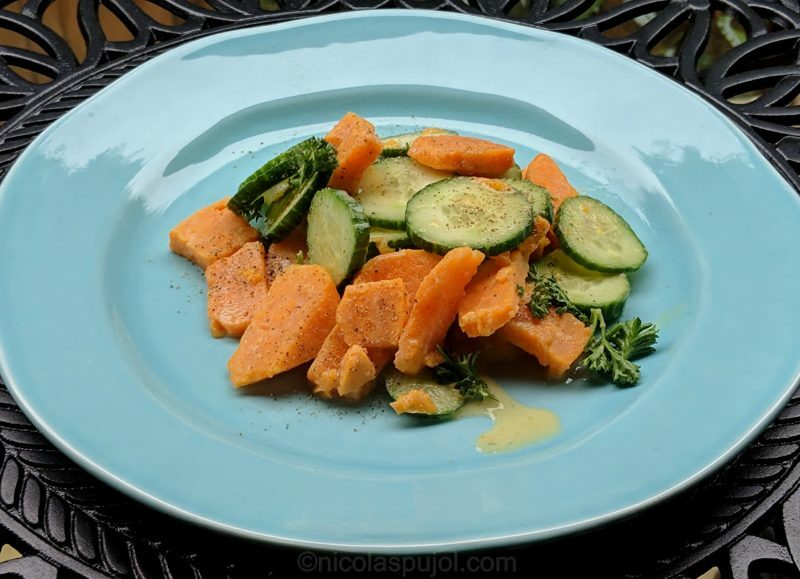 So this salad helps to put a little break on oil, with oil-free recipes. 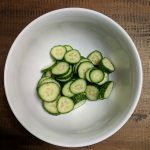 One of my concerns, when thinking about an oil-free salad, was the taste. Will it taste any good? Also, don’t I need that oil to feel satiated after the meal? These are common questions when trying WFPBNO = whole foods, plant-based, no-oil. Will this acronym catch on in the long-run? The taste turned out fine, using the lemon dressing made for this purpose. It would obviously have had an olive oil flavor otherwise, but the mustard, lemon, garlic and parsley provided plenty of aroma. 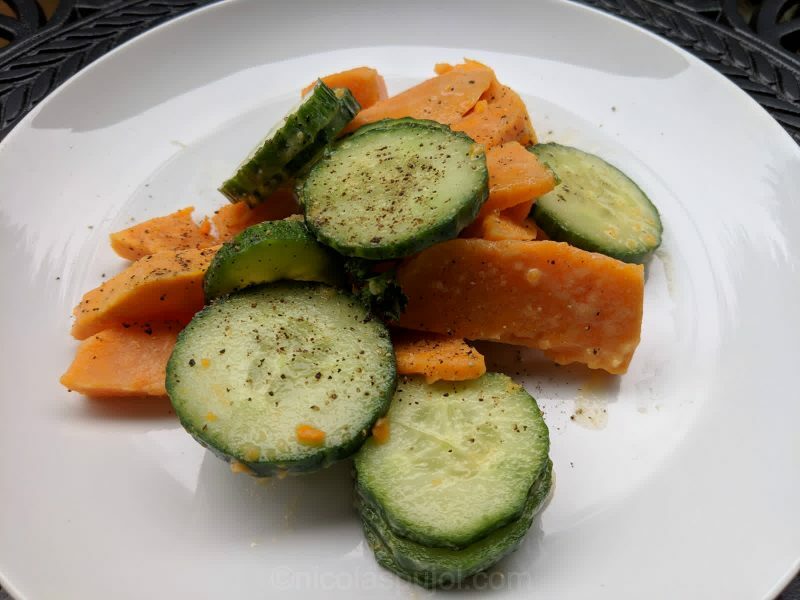 I combined cucumber and sweet potato with the intent of having the caloric density of sweet potatoes in this otherwise light salad. With the quantities in this recipe you can serve a small portion to 4 people, or make 2 full plates instead. I did opt for the full plate, and finished this gluten-free meal with a banana. 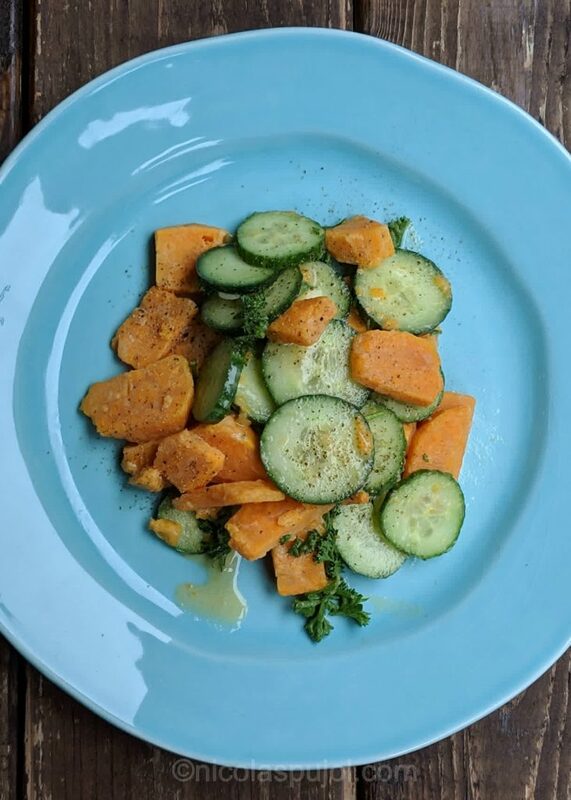 This oil-free cucumber and sweet potato salad recipe is made with fresh garlic, lemon juice, French mustard, and a little bit of parsley. Peel and cut in bite-size pieces the sweet potato. Put in water and bring to boil. 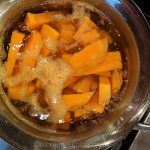 Cook for 15 minutes until sweet potato bits are tender but not overcooked (mushy), then drain and rinse under cold water. 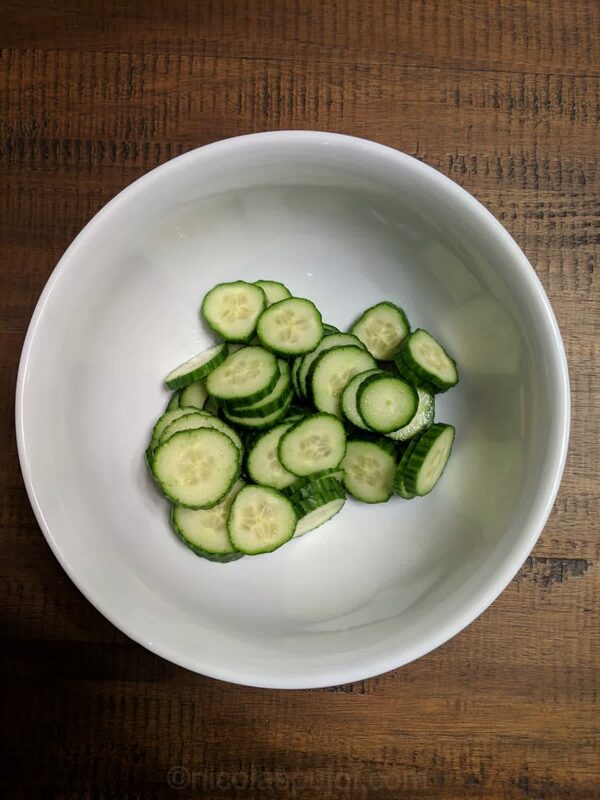 In the meantime, thinly slice the cucumber and place it in a salad bowl. 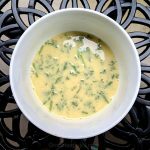 Prepare the oil-free French lemon dressing. 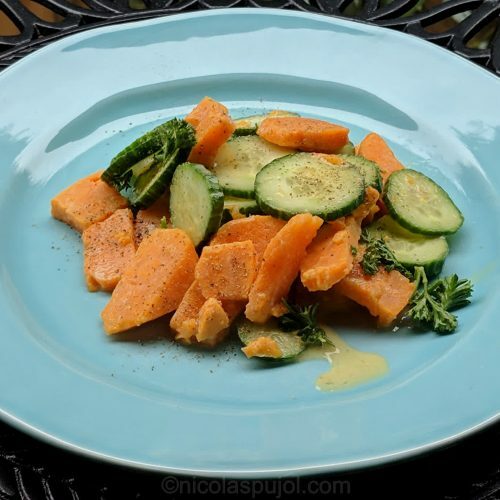 Add the sweet potatoes, the dressing, mix well and serve immediately. You can add a bit of ground pepper on top, hot sauce, and/or nutritional yeast.